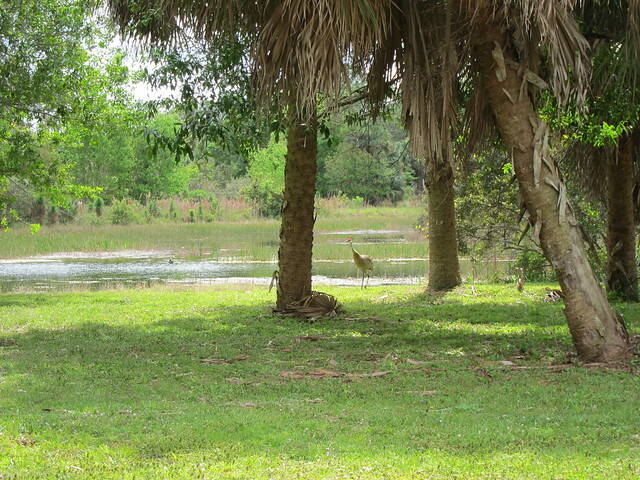 On our first full day in Florida we went up to Rivebend Park in northern Palm Beach county to paddle on the Loxahatchee River with our friend Gator Man/Tom. 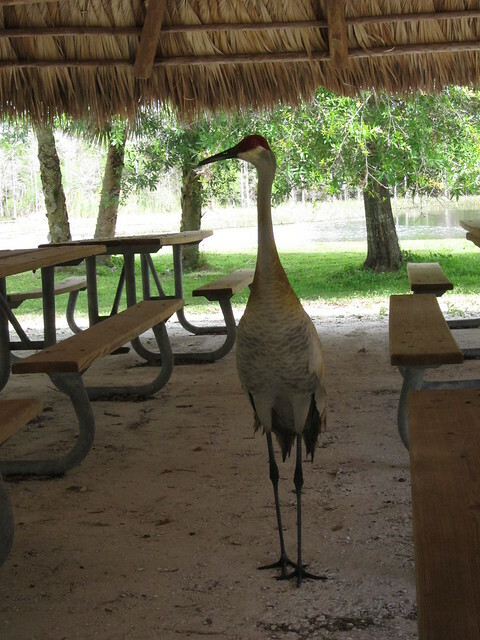 At lunch time we pulled off into a large picnic areas to eat and stand up to stretch our legs. 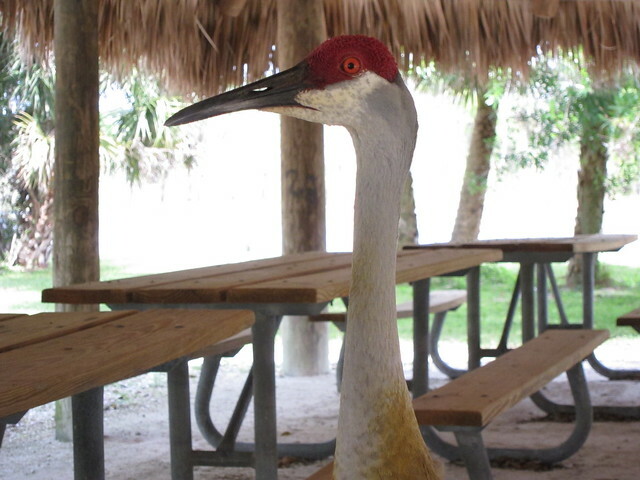 As we were sitting at one of the chickees we noticed a sandhill crane that was apparently injured. One of its legs was broken or bent backwards and it appeared to hurt pretty bad. 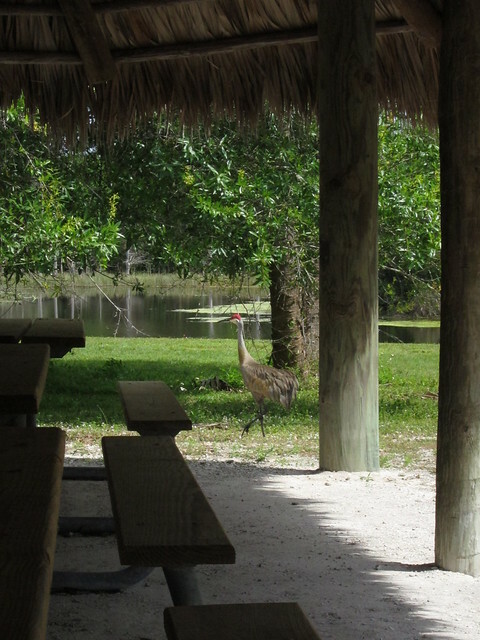 Then we noticed a second crane off behind us on the other side of the picnic area. Soon they started communicating. It’s hard to fathom how loud and echoing it was in person, but turn up your volume completely and you might understand it. The second more faint call is the second bird behind us. In addition to these two birds calling, somewhere across the water there were other cranes that we couldn’t see and occassionally we’d hear them call back. These cranes appeared to be quite used to humans as you’ll see in a few more photos. This is not a good thing as people probably feed them. I got up to go find the port-o-potty and when I returned I found what happened in the next photos. A third bird had flown in during the meantime and thought Chris and Tom were interesting enough to go scope out what was going on under the chickee. 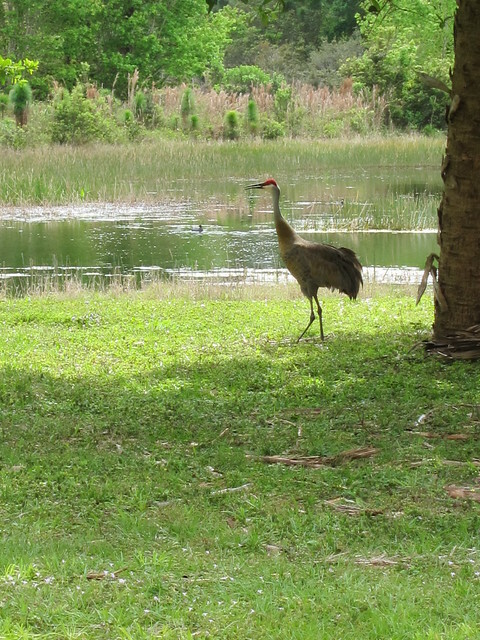 Now, these are quite large birds, standing about 4′ tall. I know what it was after, our lunch. 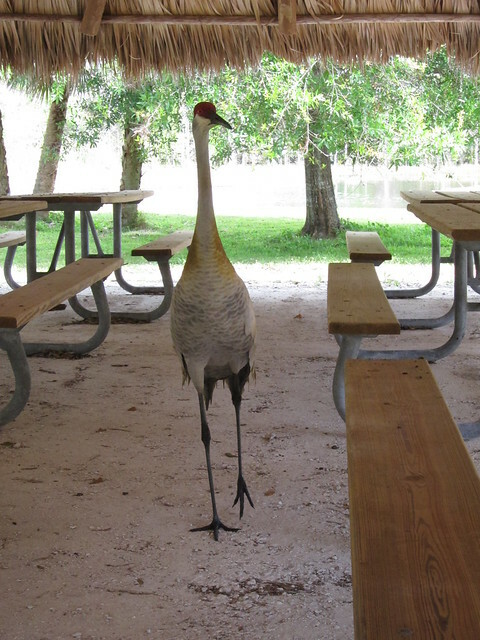 I was concerned it would either peck at Chris to get our food or just outright grab the bag of food that I slowly pulled the bag over to the far side of the table. 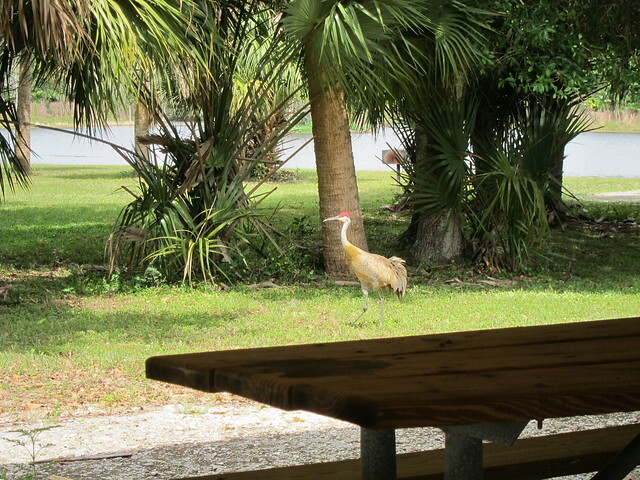 Eventually it realized that we weren’t giving handouts and opted to mosey on out of the chickee. 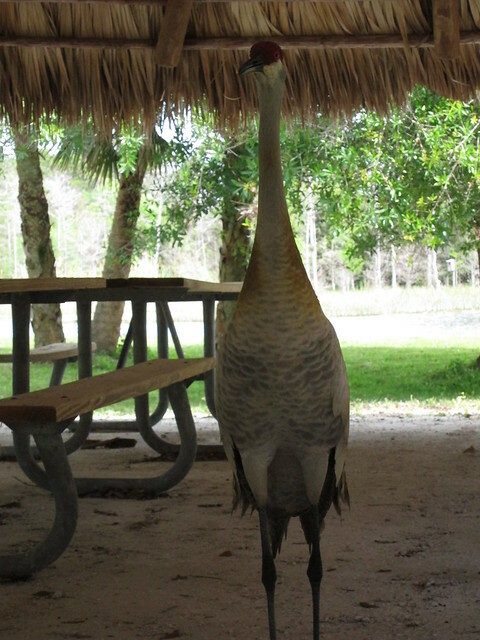 The encounter was entertaining and was by far the closest I’ve ever been to one of the birds. 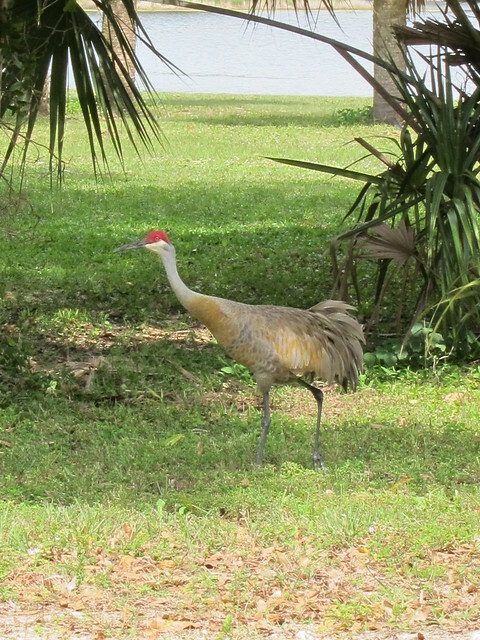 Sandhill cranes are common in some areas of Florida but are also protected too. 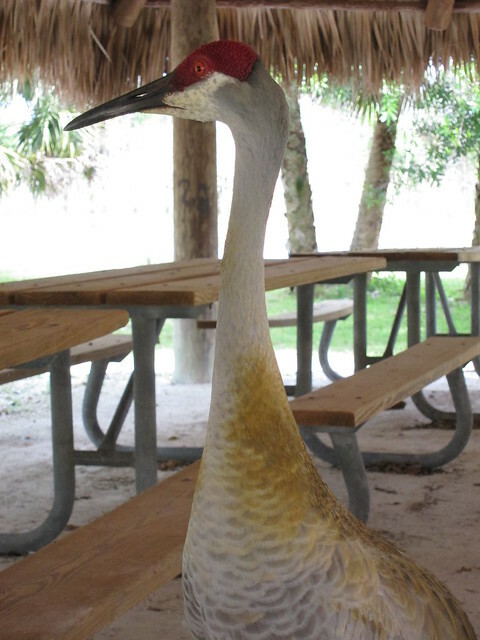 Other populations and subspecies of sandhill cranes in other states, including Texas, are not protected and it is legal to hunt them, which I find incredibly weird. Shortly after we got back in our kayaks and paddled off the injured bird started picking a fight with one of the other birds, spreading its wings and running, and then taking off in flight. Suddenly we didn’t feel quite so bad for it! Crazy that you were able to get so close!